The Alfa Romeo Tipo 33 Sport Prototype was designed in the mid 1960s to race in the World Sports Car Championship. Eventually it succeeded and won the Manufacturers’ Championship in 1975, and again in 1977. Designed by Carlo Chiti, a famous Italian engineer, the several variants of the car were raced by the Alfa factory and by many privateers as well. After the initial victories in the 2-litres Prototype category, the ‘T33/3’ version made its debut in 1969 and gained its best results in the 1971 World Championship: the Auto delta ‘open’ Prototypes won the overall ranking at Brands Hatch, Watkins Glen and the Targa Florio, being even faster than the 5-litres ‘Sport’ cars. The ‘T33/3’ cars featured a monocoque chassis, paneled in aluminum and magnesium, a V8 2998 cc engine, and a 6 or 5 speed gearbox. Top speed reached 330 km/h, at Le Mans with long tail. 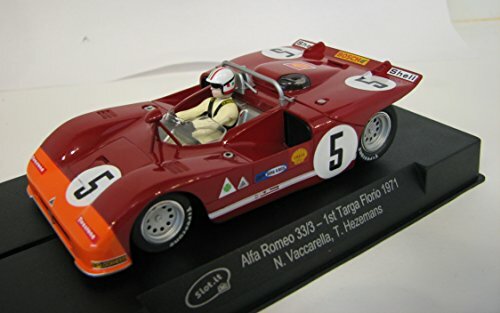 In 1971, the most important victory was at the Targa Florio, with two ‘T33/3’s finishing first and second. The race was won by Nino Vaccarella and Toine Hezemans on the car number 5.